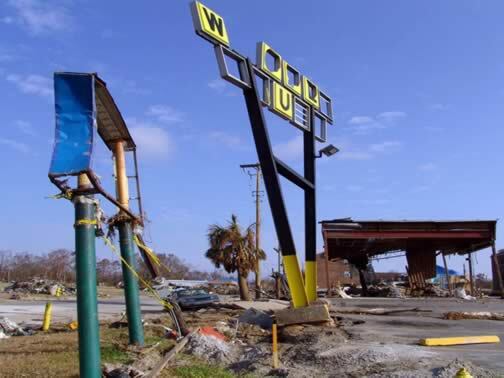 After Katrina had hit, I entered Gulfport for the first time down the street next to a Waffle House restaurant. I couldn’t tell what else had been there, as most everything had been shoved back two blocks by the tidal wave. It was a good bet that it had been a Waffle House. For 200 miles along the coast, the scene did not change. A salvager pick me up in his 4 wheel drive truck, seeing I had a camera, and drove me down the coast a ways to show me a casino that had been floating out in the Gulf 10 days before. I asked how they were going to move it back into the water and he said they was not sure, as there was not enough power available on the planet to move the monster four story steel structure out of the roadway.